When I hear the word Yamaha, it reminds me of the popular advertisements that used to (or still does) broadcast on the TV. I always thought it was an Indian company but it turned out to be a Japanese corporation that also owns a cafe, located at BoxPark. Obviously, we were excited as we expected a lively atmosphere with a theme. We visited in the evening, surprisingly it was empty and interiors being wooden flooring and wall with a corner filled with helmets and jackets and a video game placed in the middle with cool bikes. It was a tasting for two but we took our friends along as we agreed with Yamaha cafe that they will provide tasting for two and if we need anything else, we will pay. I was suppose to review their specials, Ramadan and Sports menu. Apparently, they served us juices, some sushi, a main and few middle eastern sweets. The staff failed to inform anything at all nor they served us anything Japanese to eat or drink except for sushi. It’s a shame that the team didn’t bother to explain or care, it seemed like they were more concerned if we could order and pay. They served and we were completely clueless. Some of us (foodies/bloggers) are not doing it for the free food, we actually invest our time and don’t even ask for money but that doesn’t mean the cafes/restaurants/PR has to disrespectful. 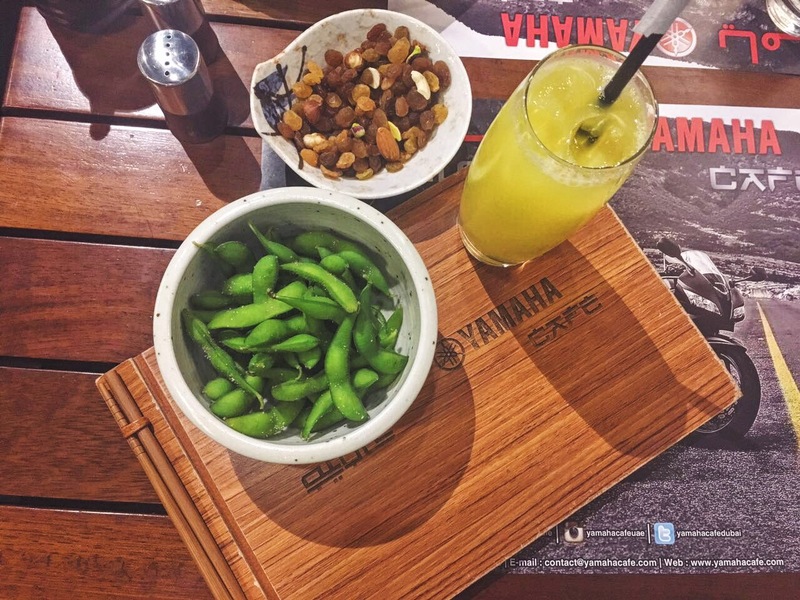 Edamame– Personally, Edamame is my favourite snack and it wasn’t bad at all at Yamaha cafe but a little bit of flavoured coating would help! 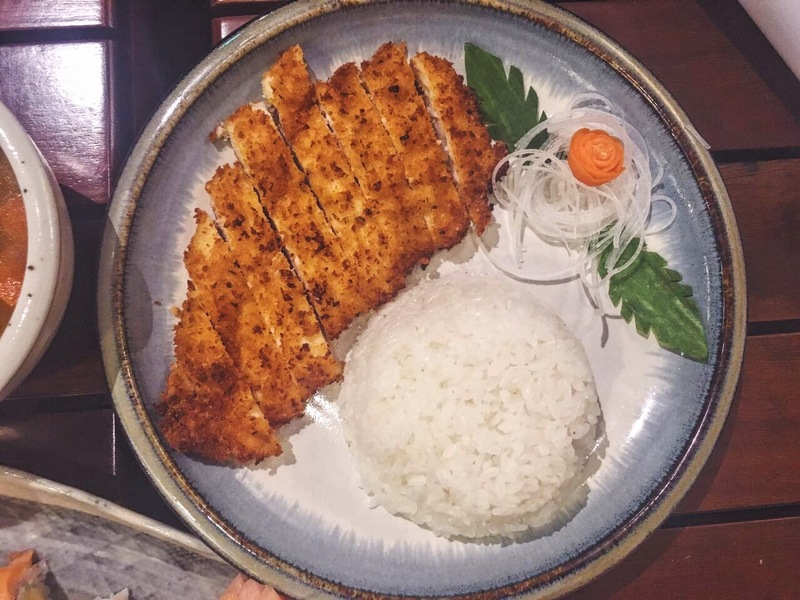 Silverado Katso- Succulent and deliciously flavourful, tender and tasty chicken! The crunchiness with the curry combination is too good! Sushi (Rainbow roll and Super Tenere Roll)- A visual treat as for the beautiful popping colours and presentation! 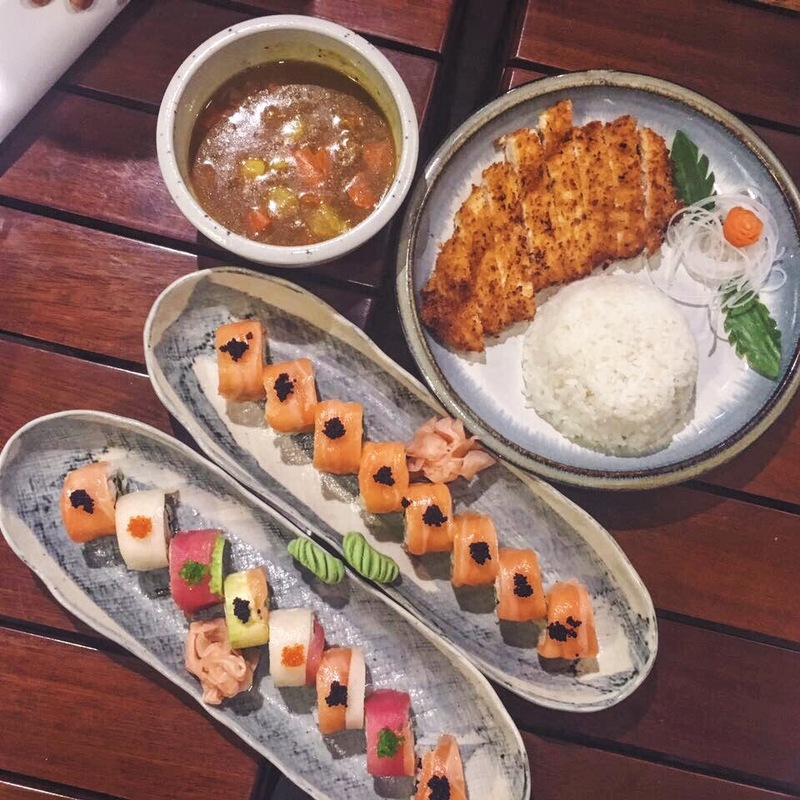 Sushi is kind of a food that not everyone may like so the real question is, should you try sushi at Yamaha when its your first time? Yes, go ahead! Fresh, authentic, good quality and my taste buds approved them! I liked Super Tenere roll better as for it’s little bit of spicy flavor touch exploring in the mouth! Overall, it was a ‘I am not sure’ discovery as I am not sure how to rate a restaurant based on two dishes, both were delicious and I recommend them but the services killed the overall experience! Thank you Mr.Mohammad and Mr.Steven!